Yesterday, Marty McGuire published an audio version of the IndieWeb "This Week" newsletter, and shared the link in our chat. Aside from being a fantastic production, this also sparked some discussions about Webmentions. His podcast uses a few of of my 100Days songs, which he cites in the description. Since he included a link to my posts about those songs, his podcast now appears as a comment on those pages! In the chat, Tantek posed the question of how a post like Marty's podcast could link to audio it uses and indicate the range of audio that uses that piece. There is already a Media Fragments URI spec, published in 2012, but it was at first unclear as to how widely that was implemented if at all. The spec is also kind of complicated. It starts out simple, but then has a bunch of features that seem to be made up out of nowhere. The simple stuff is based off of YouTube's fragment syntax for linking to specific times of a video. In the Media Fragments spec, if you visit a URL of a media file with a fragment of "#t=10", the browser should immediately skip to 10 seconds into the file. There is also a syntax for specifying a range, such as "#t=10,15" which indicates the range from 10 to 15 seconds. Dynamically modifying a source element and its attribute when the element is already inserted in a video or audio element will have no effect. To change what is playing, just use the src attribute on the media element directly. Summary: If the page URL has a fragment, and that fragment starts with t=, then find all the video and audio tags on the page, and update their URL to include that fragment. This actually works great, but I wanted to take it further. I left this example here because it's easier to read than the snippet that follows. To round out the whole experience, I wanted a few things. 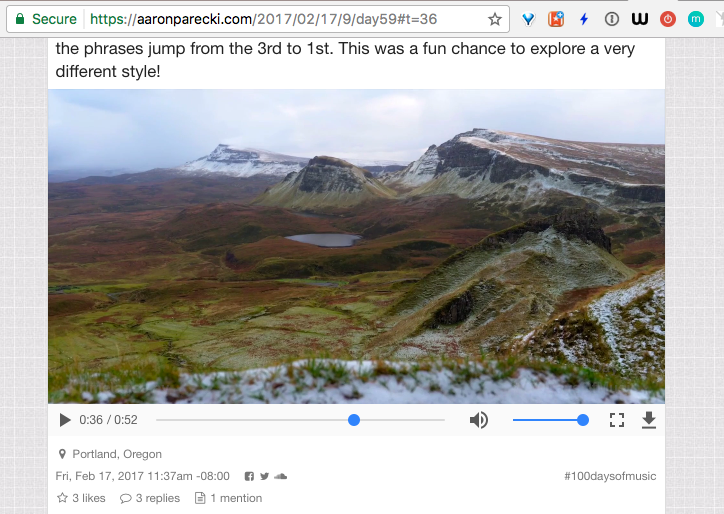 If you pause the video, the page URL fragment should update to the time offset at which you've paused. This makes generating these fragment URLs easier. If you change the fragment URL manually, that should copy the fragment to the media again. This also makes it easier to generate these fragment URLs. Here is the code that accomplishes all of these. Now when you visit any of my pages that include audio or video, you can quickly get links to specific time offsets! I've published this on GitHub so you can keep up with the latest version of the code there!